While assigned to defend the Cumberland Gap, Confederate General John W. Frazer, commanding, without the slightest hint of resistance to the enemy and absent a single attempt to evade the foe, surrendered his entire command of over 2,000 men to Union General Ambrose E. Burnside, including several hundred North Carolina soldiers, on September 9, 1863: 58th North Carolina, 4; 62nd North Carolina, 442; 64th North Carolina, 288, for a grant total of 744 North Carolina troops captured and sent to Union prisons for the remainder of the Civil War. How important was the Cumberland Gap during the Civil War? Major B. G. McDowell, 62nd North Carolina, stated that "When I was told by General Frazer that I had been surrendered, and that I and my regiment were prisoners of war my indignation and that of my regiment knew no bounds. I informed him that I would not be made a prisoner of war that it took two to make such a bargain as that under the circumstances, and that he could not force me to do so. Sharp words were exchanged, and I called up all of the Sixty-second Regiment who were willing to take their lives in their hands and all of the other commands in the Gap who were willing to join us, and said to them, "If you will go with me we will go out from here, and let consequences take care of themselves." Captain B. T. Morris, 64th North Carolina, wrote that: "The Sixty-fourth was at that time much reduced in number. The officers were sent to Johnson's Island and the privates to Camp Douglas on December, 1863. The number of non-commissioned officers and privates belonging to the Sixty-four. So, while the Sixty-fourth North Carolina Regiment can not boast of battles fought, or deeds of daring, yet its career was one of hardship and endurance, always ready to act promptly at every command. A number of good men were lost, killed by bushwhackers and concealed enemies. There were, however, several officers and some privates who would not surrender and made good their escape at Cumberland Gap with Major B.G. McDowell, of the Sixty-second North Carolina, through the mountains and again went into active service. The total surrendered so shamefully by General Frazer at Cumberland Gap was 2,026 prisoners, 12 pieces of artillery, and great stores of provisions and ammunition and quartermaster supplies." 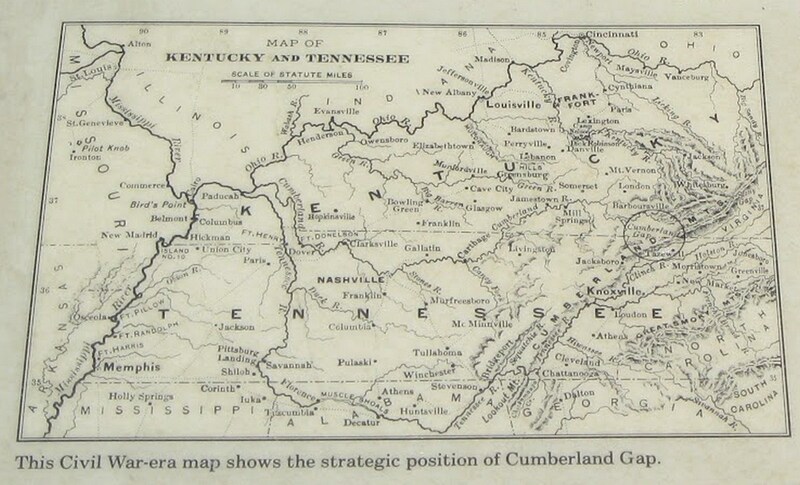 While the 58th North Carolina Troops had only 4 of its troops in the area captured, the bulk of the unit had already been reassigned to Big Creek Gap, near Jacksboro, Tennessee, on outpost duty conducting picketing in the vicinity, including several passes of the Cumberland Gap. The regiment also made several expeditions into Kentucky to ascertain and strike the enemy as circumstances permitted. According to Colonel John Palmer, 58th North Carolina, commanding, the 58th was forwarded and fought at Chickamauga, September 18-20, and suffered over 50% casualties of the number carried into action on September 19. Casualties totaling 161, were killed, 46; wounded, 114; missing, 1 (missing was POW). An earlier after battle report indicated 39 killed and 121 wounded at Chickamauga, but in a revised report 7 soldiers were listed as mortally wounded and moved from wounded to killed category. In late December 1862, while guarding bridges and railroads in East Tennessee, three poorly armed companies (295 soldiers) of the 62nd North Carolina Regiment were captured by a Union cavalry force of 3,000. 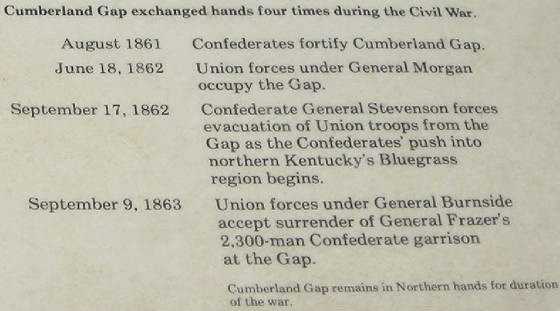 The 62nd continued to serve and fight in East Tennessee until 442 of its men were surrendered to Union forces in the Cumberland Gap on September 9, 1863, by General Frazer, who many consider a coward for not fighting nor trying to evade capture, but as many as 200 soldiers from the 62nd evaded capture and in April 1864 the unit mustered 178 men in Asheville. 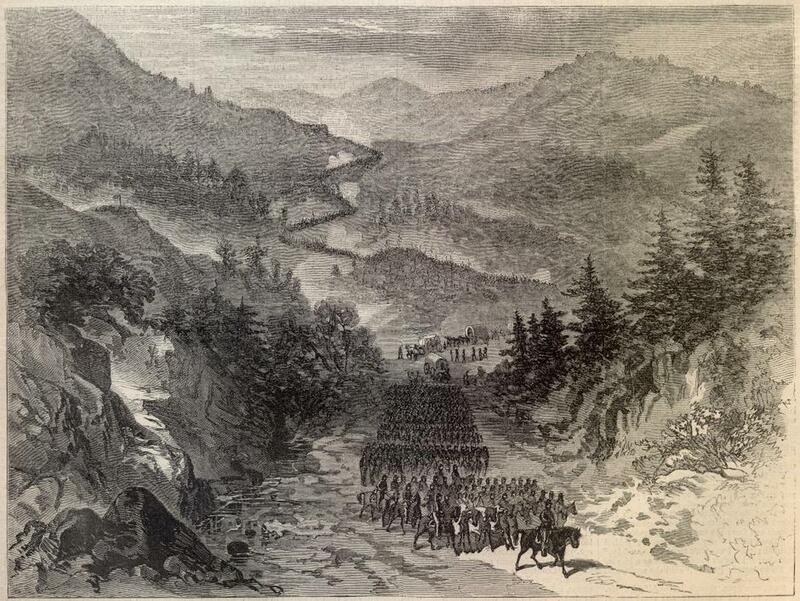 The bulk of the fighting at the Battle of Asheville one year later, April 6, 1865, and just three days prior to Lee surrendering to Grant, was shouldered by the remaining 175 steadfast warriors who formed the ranks of the depleted unit for its final mustering. Why all the fuss about one location on the planet? The Old Wilderness Road cutting through the Gap was a natural invasion route. For the Confederacy, it led to the rich Kentucky bluegrass country to the north. For the Union, it led to the Northern sympathizers of East Tennessee, and to an opportunity to cut rebel supply lines. In late summer of 1861, the Confederacy seized the Gap and made it the eastern anchor of a defense line extending to the Mississippi River. Brigadier General William Churchwell was placed in command, and fortified the garrison during the fall of 1861. He built seven forts on the north facing slope, and cleared the mountains of all trees within one mile of each fort. The Confederate forces were already stretched and were also desperately needed in other areas. Union Brigadier General George W. Morgan soon arrived to take possession of the Gap. The 20,000 men under his command began building nine south-facing batteries to repel an invasion. "But none came." The Confederates under Lt. Gen. Kirby Smith flanked the Gap with a force of 12,000 men and moved into Kentucky, severing Morgan's supply line. Without food and still fearing an attack, General Morgan boldly led his men north through enemy territory to safety. The Confederates returned to the Gap, cleared up the mess Morgan and his men left behind, and strengthened the forts. Many skirmishes took place, as Unionists from Tennessee raided the garrison. In September 1863 a Union force under Maj. Gen. Ambrose E. Burnside moved toward the Gap. On September 7, the Yankees destroyed provisions stored at the Iron Furnace. Burnside also deceived the Confederate commander, Brig. Gen. John W. Frazer, into believing that his force was much larger. Believing his Confederates to be outmanned, and short of provisions necessary for a long siege, Frazer surrendered his garrison on September 9.